Here’s part 2 of the series. You might want to read part 1 to familiarize yourself with VersaMail, as I won’t be repeating it here. 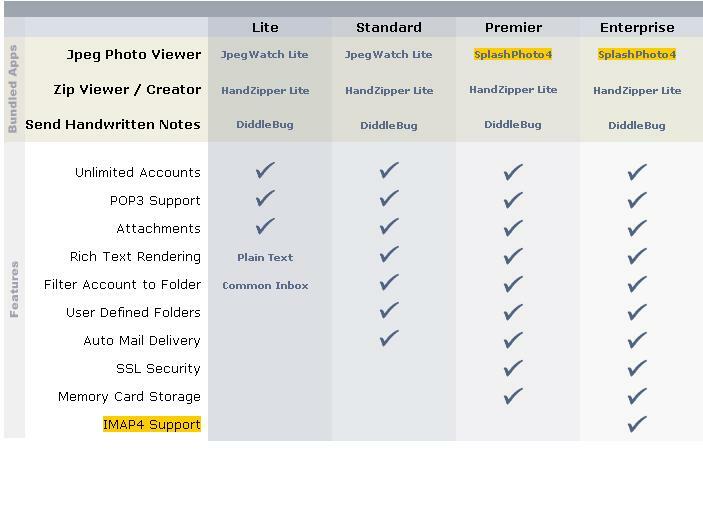 SnapperMail has 4 versions: Lite, Standard, Premier and Enterprise. The image above highlights the key differences between the versions (and the bundled helper applications). 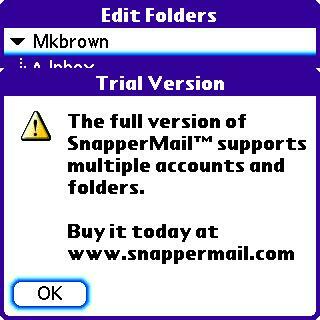 SnapperMail has a 30 day trial version available which has most of the features of the Enterprise version available. It has pop-up messages when you access features that are not found in the standard version; it’s their way of letting you know it’s going to cost you to do that function. 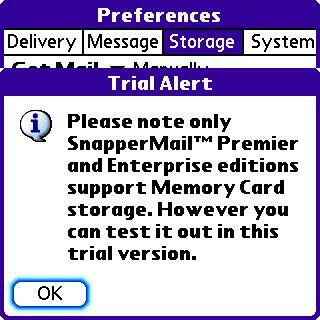 So, the more pop-up messages you hit, the more it’s going to cost you if you decide Snapper fits your needs. Two things to be aware of with the “Lite” version: it doesn’t support “Rich text” (HTML mail), and it doesn’t support folders. The Standard version seems to be the closer to VersaMail’s feature set than the Lite version. Now, notice that I said “most” Enterprise features; I found Snapper to have one of the most irritating trials of any software package I have ever used. The whole point to a trial program is that you get to try it – all of it; otherwise, why bother? When you run Snapper for the first time, it creates a default POP account, and a default IMAP account with one subfolder; that’s a nice touch for creating a default set-up for the new user. You can edit what’s provided to set it up for your service provider, but you cannot create new accounts or additional subfolders. So it really doesn’t give you the chance to really try the program using your “normal” set-up. I would’ve liked to try it with multiple sub-folders, and moved mail between them using my existing structure and workflow, but I couldn’t. Had I not been writing this review, I would’ve deleted Snapper off my Treo just because of it’s limited trial. Think about it this way; if you have something that works and comes with your device (VersaMail), and you’re trying something else (like Snapper) to see if it’s worth paying for to get some added functionality or usability, but you couldn’t really use it the way you were using the free one, would you buy it? Here are screen shots of some of the “nag dialogs” I ran into during my trial. Snapper has a really attractive user interface; simple, clean and easy to use. There are two modes of operation, finger mode and stylus mode. Stylus mode gives you the most “stuff” on one screen by using columns for different attributes, and 1 line (row) per email. Sorting emails is done in the stylus view by tapping on the column headers; tapping toggles between ascending and descending order. The sort order set in stylus mode is used in finger mode as well. Finger mode makes each email occupy two line, making it a bigger target for “finger-tapper’s”. 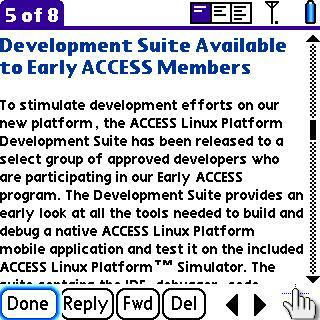 The same functionality is available in the drop down list in either mode, or you can use one-button hot keys like ChatterEmail or the Blackberry e-mail client. POP mail retrieval is increadibly slow compared to VersaMail. I grab it on-demand, and not at scheduled intervals due to my particular set-up and preferences. IMAP mail is quite speedy in comparison, and ran on-par with VersaMail’s IMAP access. I opened SnapperMail one morning, to find a database error. Tried launching it again, same problem. Ok… So I exited to launcher, then soft reset the Treo, and opened SnapperMail again to find… I had lost all mail. I had to then retrieve it all from the server. This is a good reason to leave POP mail on the server (or use an IMAP server). 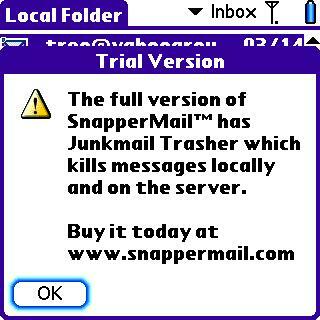 Now, in all fairness, I can’t say that Snapper is the only software to have ever done this to me… VersaMail 3.1 has done it to me twice since I stopped using Snapper, and VersaMail loses everything including your account setup information when it bombs. But, considering I was storing the E-mail on the SD card, I would expect that something like that shouldn’t happen with Snapper, which only stores the indexes in RAM, and not the actual mail like VersaMail. It should recover more gracefully than it did. Overall, I found Snapper to be nice to use, but it wasn’t enough to convince me to want to buy it. It doesn’t have push e-mail (not that I want or need push), so that wouldn’t compel me to buy it. It has one button functions, but is that worth $60 to me? Same with Junk mail controls (which I couldn’t test due to trial limitations); it’s nice to have, but is it worth the cost? 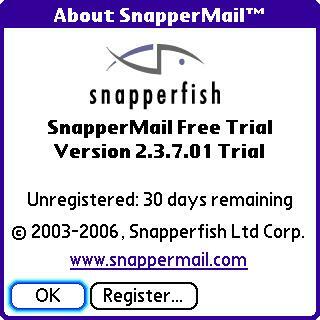 If Snapper had come bundled with the Treo, I would happily use it and not feel the need to look for another e-mail client. But, it didn’t, and I don’t feel that it offers any “must-have” features over VersaMail that justify me buying the Enterprise edition I would need for IMAP. It might be different if I only used POP accounts; then I could buy one of the less expensive versions, which would make Snapper more attractive. Since Snapper is priced is US dollars, I always have to consider that the price is going to be more expensive when converted to Canadian currency. Other than the limited trial, I can’t really complain about Snapper; it works well, it’s powerful and easy to use, and it does the job. Now, for anyone who will say I haven’t covered some of the special features of Snapper or Chatter like filters and Junk controls, it’s because I don’t use filters on mobile devices – not even in VersaMail. I do all my filtering with server-side rules; e-mail that doesn’t belong on my Treo will never get sent over-the-air. Stuff that shouldn’t be on my Treo gets filtered into folders, and I can pull it manually when I want it by syncing the IMAP folder, or by reviewing it on my desktop mail client. 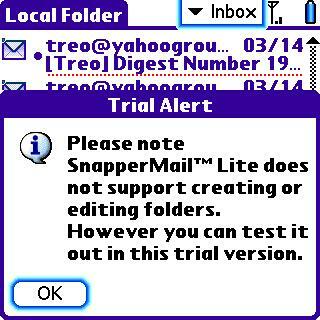 Overall, I found Snapper to be an excellent mail client for the Treo, but I didn’t find it to be miles ahead of the VersaMail client that ships with the Treo. 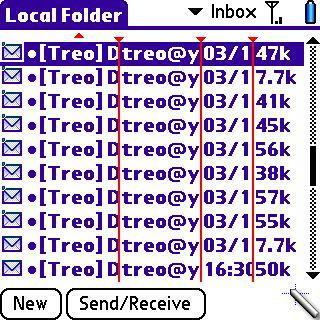 Users of newer Treo’s like the 680, 700p and 755p already benefit from a more stable version of VersaMail than what shipped with the 650. 650 users can get an update to VersaMail 3.5 and Exchange ActiveSync for $11 CDN. Given that ChatterEmail has been bought by Palm, and it’s author is presumably working on adding some of Chatter’s features to future versions of VersaMail, the Snapperfish folks may be facing a tough battle going forward if they maintain their present pricepoints. This entry was posted on July 20, 2007 at 12:14	and is filed under E-mail, Palm, Reviews, Technology, Treo. You can follow any responses to this entry through the RSS 2.0 feed. You can leave a response, or trackback from your own site.